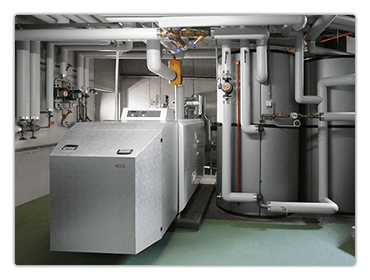 On the Lehnisweidstrasse estate in Widen (Canton of Aargau), a complex consisting of 50 residential units of different sizes, the heating system has been completely modernised. Thanks to this extensive modernisation, it was possible in ”Lehnisdörfli” (little village of Lehnis), as the modernization project is commonly referred to by the locals, not only to greatly enhance the convenience factor, but also to save a great deal of energy for the heating and water heating system. All the key components of this new heating solution came from a single supplier – namely from ELCO. These include the convenience heating centre, an exhaust gas heat exchanger, a solar plant in addition to the complete control system. All the components are perfectly matched to each other. The result being improved energy efficiency, environmental friendliness, convenience, reliability and cost-efficiency. Altogether, it is possible to save 30 to 40 % of all energy costs with this heating solution. And even as much as 50 % on the basis of maximum consumption.